Have you ever found yourself laughing for what apparently seemed – no reason at all? That silly rumbling feeling that erupts and causes you to just LET GO? We are vibrational beings. Each of us is a ball of energy and have a unique vibration. When we are in balance we are in harmony with the frequency our vibration was designed for. A healthy being has a high vibrational frequency of around 62-72 Hz and when it drops to lower levels your body can become susceptible to colds, flus and various forms of dis-ease. The definition of frequency is: the number of occurrences of a repeating current flow per second. Your mind, body and spirit is effected by your vibration. There are many ways to raise this and laughter is one element. Have you ever been around someone that seems to only crack a smile and you know that this is the best you will ever get regarding a “chuckle?” How is your energy effected by this? 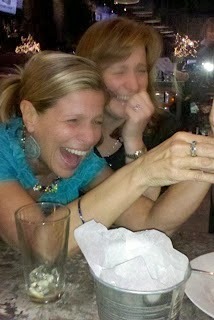 Now think of the person you know that has an infectious laugh. How does this effect you? I was raised in a family that seemed to have more to cry about than laugh. But I had the good fortune to have a parent that used laughter to combat negative energy. I look back in wonder remembering the threatening letters and phone calls from bill collectors. How they stretched a tiny pay check to clothe and feed 8 kids. Yes, of course there were many tears, but it isn’t really the lows that have stayed with me. It is the laughter. I remember once when my father was asked to speak at his sister’s 80th birthday he began a little story that started out, “We were so poor they invented welfare to feed us. Our house was in such disrepair we had to paint it to condemn it. As kids, we stole the bones from our neighbor’s dog to make soup, and when the dog died we thought we killed it.” On and on he would continue and the entire crowd was laughing so hard they were in tears. Yes, these are the tears I think of when I recall those struggling days of my youth. Find your own laughter. Surround yourself with people that bring joy to your life. We do not always have the ability to rise above our daily woes, and for many they are dealing with grief, illness and despair. Yes, these are very real situations that some of us must navigate along our journey. It is in the realization that we are on a journey that we can look for avenues that may bring something sweeter into our horizon. Do something silly. Play a game with your family members and even your pets. 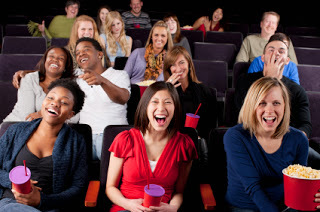 Watch a funny movie (check out OLD flicks too.) Find a way to laugh and raise your vibration. Once you LET GO and really laugh you will feel lighter. This lighter feeling you are experiencing is your vibration rising to the place is was designed to be. Meditation can also bring a feeling of renewed energy. This too will raise your vibration. Begin today to find your voice and when you do LAUGH… at the world, the circumstances that are beyond your control and especially yourself.